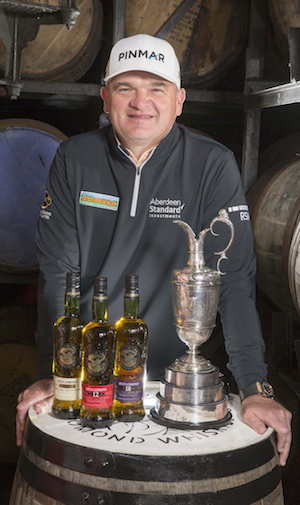 Loch Lomond The Open Special Edition, Loch Lomond The Open Course Collection Carnoustie 1999 and Loch Lomond 1999 Vintage Autograph Edition have been created master blender Michael Henry in partnership with golf legends Colin Montgomerie and Paul Lawrie (pictured). “These whiskies pay tribute to Loch Lomond’s fruity distillery character and are bottled in the traditional artisanal manner - non-chill filtered at higher strength - to provide a richer mouth feel and a deeper more complex flavour,“ said Henry. Loch Lomond The Open Special Edition (46%) has a RRP £36 and is said to have notes of peach and pear created by wine yeast fermentations with creamy vanilla oak and maple syrup with hints of peat smoke. The expression is available worldwide and in selected global travel retail markets from June 2018. Colin Montgomerie, who collaborated with Henry on the production of The Open Special Edition, said: “As a proud Scot I know that Scotland is world-renowned for both our whisky and our unrivalled golf courses. Loch Lomond The Open Course Collection Carnoustie 1999 (47.2%) has a RRP £150 and has been named after the course set to host this year’s Open Championship in July. The whisky is said to carry fruity notes on the palate with deep aromas of honey, tropical fruits and hints of maple syrup and oak. The expression is limited to just 1,500 bottles worldwide and is available in selected global markets from June 2018.
and master blender, Henry has used casks from 1999 to commemorate Paul Lawrie’s famous victory at Carnoustie. The whisky is thought to have an underlying fruit character with honey sweetness and tropical fruits also present and the edition is now available globally. All three of the Loch Lomond special editions will all be available to buy at The Open in July. Founded in 1814, Loch Lomond Whiskies uses a combination of traditional swan neck and rare straight-necked pot stills to create a wide range of whisky styles. The site is located within two kilometres of Loch Lomond, a National Park in Scotland and is one of the few distilleries with its own cooperage.